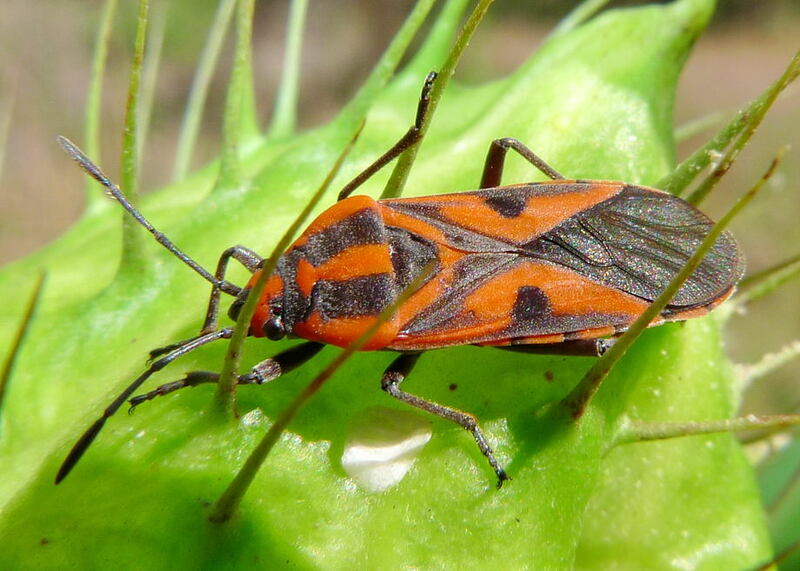 This page contains pictures and information about Lygaeid Bugs in Superfamily LYGAEOIDEA that we found in the Brisbane area, Queensland, Australia. Bugs in superfamily LYGAEOIDEA may look very similar to those in COREOIDEA. They can be distinguished from the Coreid Bugs by their forewings which have less dense longitudinal parallel veins. There are at most five of those veins. Lygaeid Bugs are mostly in bright red or yellow in colours, with some are black or brown. They have elongated body. Ocelli present. Scutellum with distinct and weakly raised Y-shaped mark. On fore-wing membrane usually has 4-5 longitudinal veins. Seeds Bugs in Rhyparochromidae are small is size and dull in colour. They are either brown or mottled with dark and pale patterns. The head is usually large and triangular with ocelli. Antennae are four segmented. They usually have strong front legs. 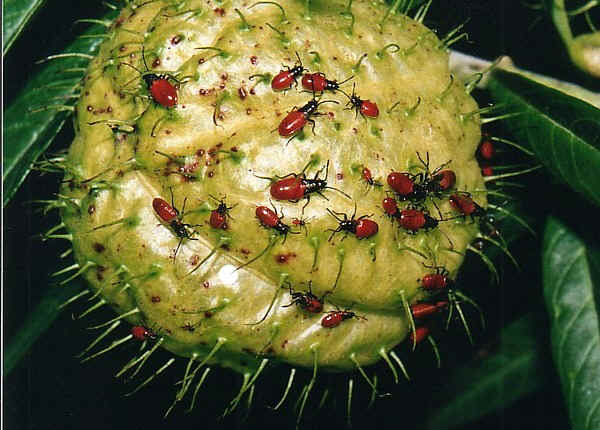 Most of them feed on ripe seeds that dropped on ground. Fightlessness is common in this family. Members in his family have their forewings with 4-5 veins. The front section of their forewings is slightly harden and the back section membranous. They are usually brown to red in colour. They are from 4 to 20mm long, with oval shape and flattened body. Their antennae are four segmented. Bugs in this group have very big eyes and they are commonly called Big-eyed Bugs. They have either elongate, elongate-ovoid or oval body. They are seed feeders but also known to be predaceous. This geocorids were put as the subfamily of the Lygaeidae. They are raised to family level in 1997. We found one species in this family. The bugs are small in size. Their back is triangular-patterned in black and white colours. We found them on our hibiscus plants on early spring. 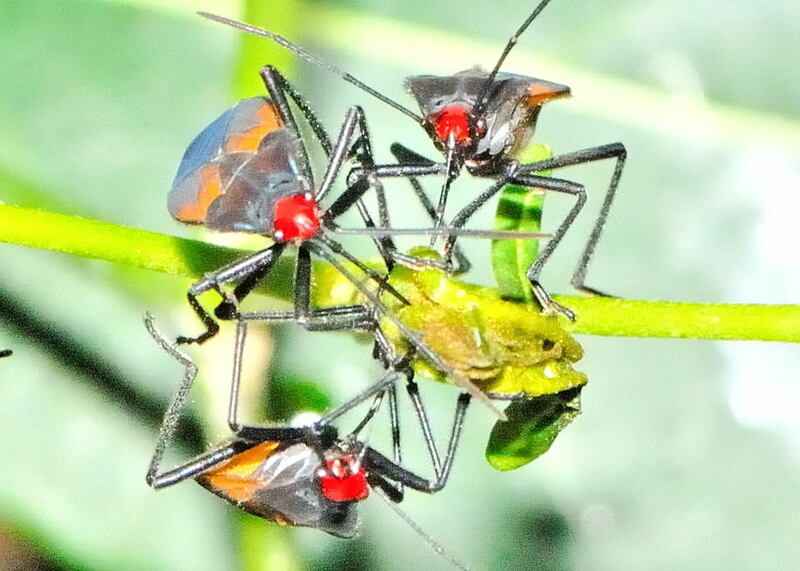 The nymphs are black in colour with blood-red abdomens. This is a small insect family in Australia. There is not much information about them. 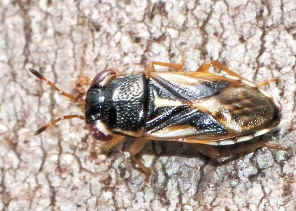 The bugs have the slender and elongated body usually pale brown in colour. The antenna are very long. The front pair of legs are enlarged and armed with prominent spines. 1. Insects of Australia, CSIRO, Division of Entomology, Melbourne University Press, 2nd Edition 1991, pp 429. 2. 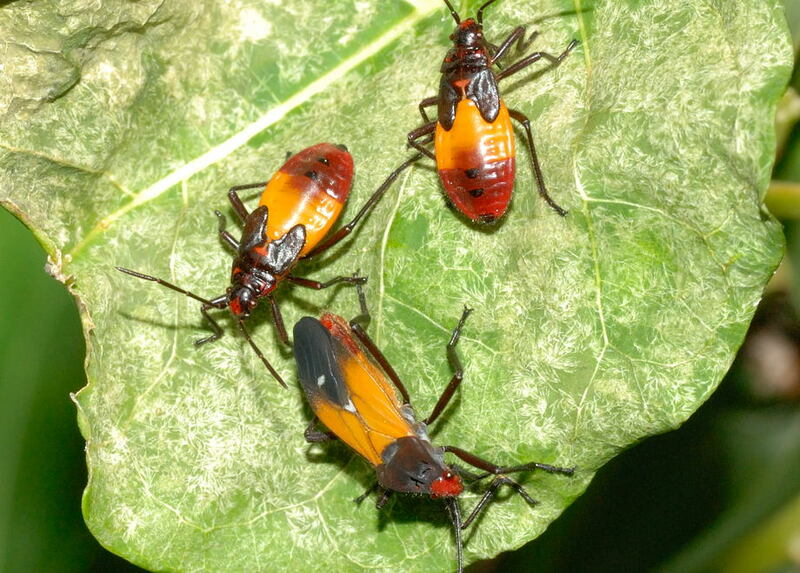 Plant Bugs - Dr Murray Fletcher, PRIMEFACT 508, NSW DPI, May 2007. 3. Superfamily LYGAEOIDEA - Australian Faunal Directory, Australian Biological Resources Study. 4. Insects of Australia and New Zealand - R. J. Tillyard, Angus & Robertson, Ltd, Sydney, 1926, p146.